The perforated row cover is made of polyethylene to create a warmer microclimate during the day; but at night, temperature can decrease under the polyethylene. Offers a better yield compared to straw for strawberry crops. Earlier yields : the microclimate under the row cover speeds up plant growth. 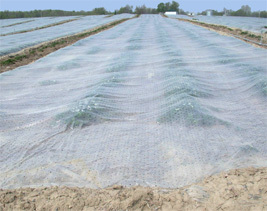 The Perforated row cover is not recommended for other types of crops because it creates too warm a climate under itself that may burn the plants’ leaves.